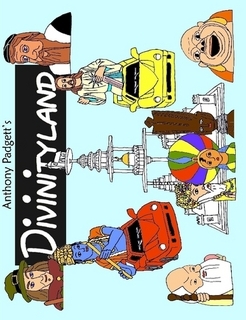 Divinityland is an illustrated childrens interfaith book about a magical kingdom that could be far away, or just around the corner. is an illustrated childrens interfaith book about a magical kingdom that could be far away, or just around the corner. It is a place where Gods from all around the world share in love and peace. Their houses are open to all the other Gods and they use cars, trains and magic carpets to meet each other and play. Follow the adventures of Buddha and the Bunny, Christ and the Chick, Rabbi David and the Duck, Krishna and the Kitten... Welcome to DIVINITYLAND!!! 20 full colour pages, US letter (8.5"x11"), saddle stitched.